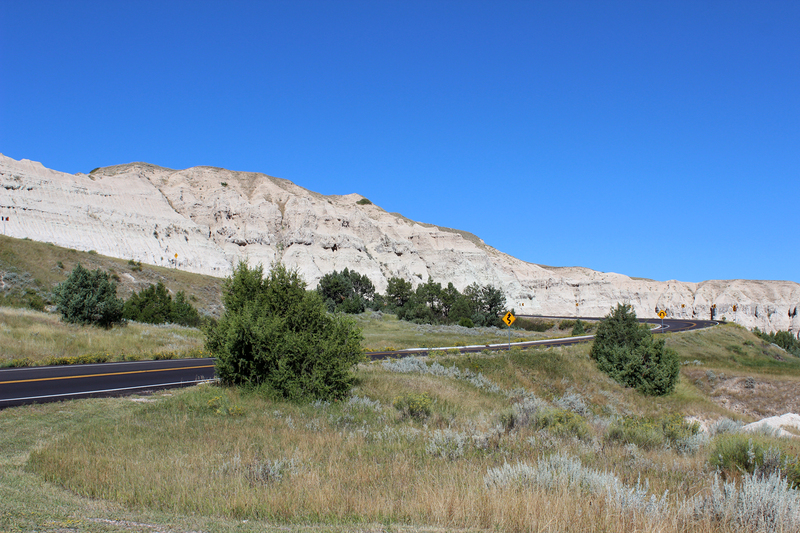 The Badlands Loop Road, which is not actually a loop, twists for over twenty-five miles above and below the Badlands Wall, offering an almost overwhelming density of scenic views, both from the windshield and at a series of interpretive overlooks and pullouts. 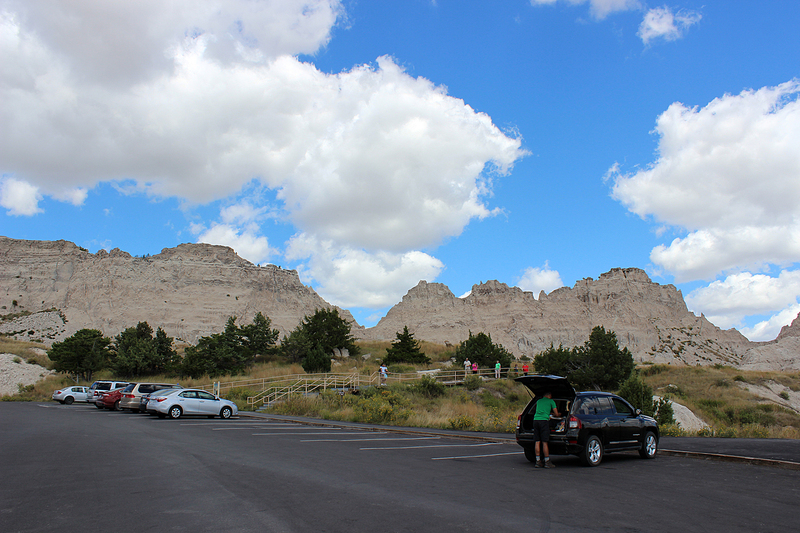 It is a classic example of making the wonders of a park easily accessible to motorists, a philosophy that dominated the Park Service’s thinking in its first half century. On my previous visit, Lisa and I had motored along the road from east to west. This time, Sean and I would take the drive from west to east. After our encounter with the Bighorn Sheep and an additional encounter with a grazing herd of them on the side of the road, which had stopped traffic, we turned right onto the paved Loop Road and stopped at the first overlook. In the direction we were traveling, the Pinnacles Overlook was the final view of Sage Creek Basin. 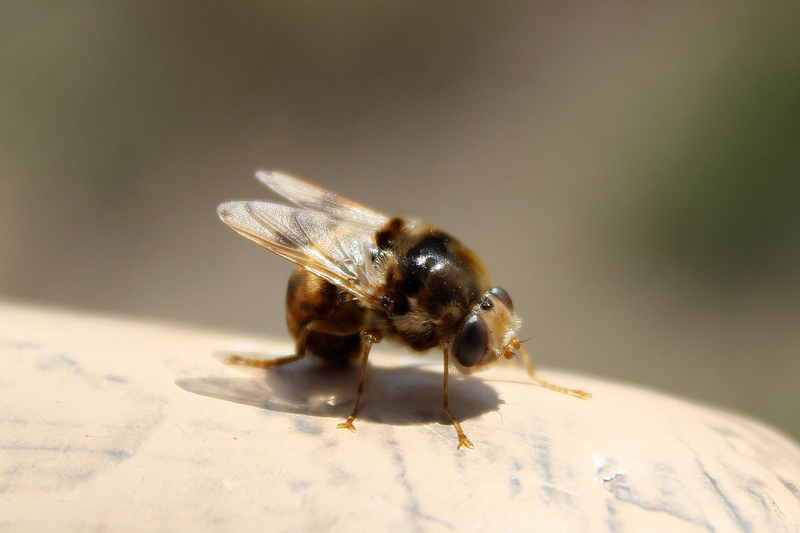 It was also a great vantage point to notice the micro-habitats in the park. 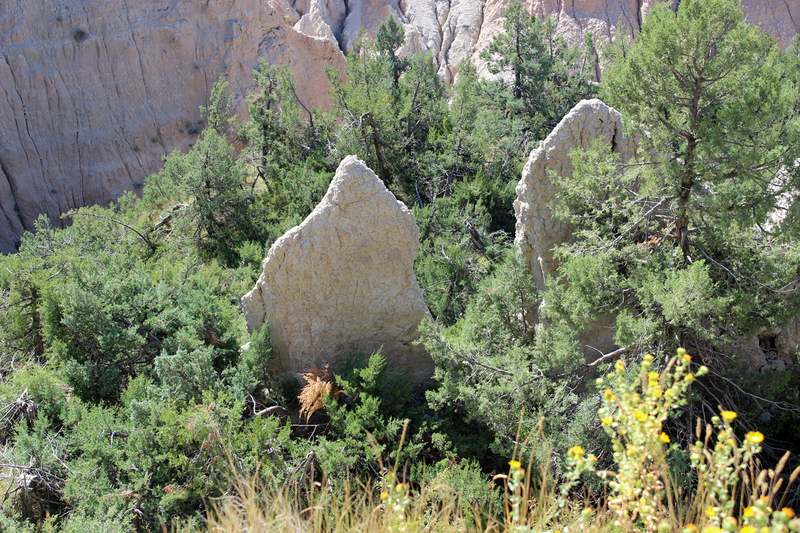 Juniper woods grew in the steep canyons between the basin floor and the rim of prairie. I spotted a White-Breasted Nuthatch looking down through the trees from the rim. 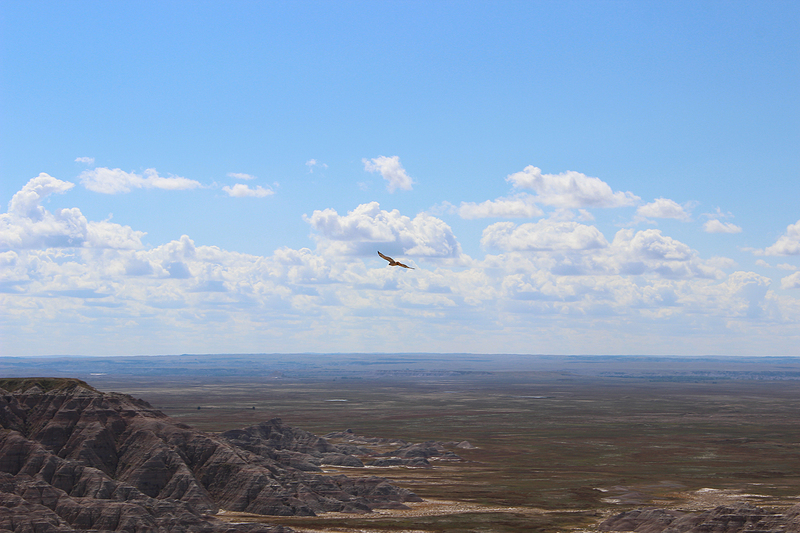 But then, and this is nearly impossible to capture in still images, immediately behind us was prairie. So looking forward, I took the above image. 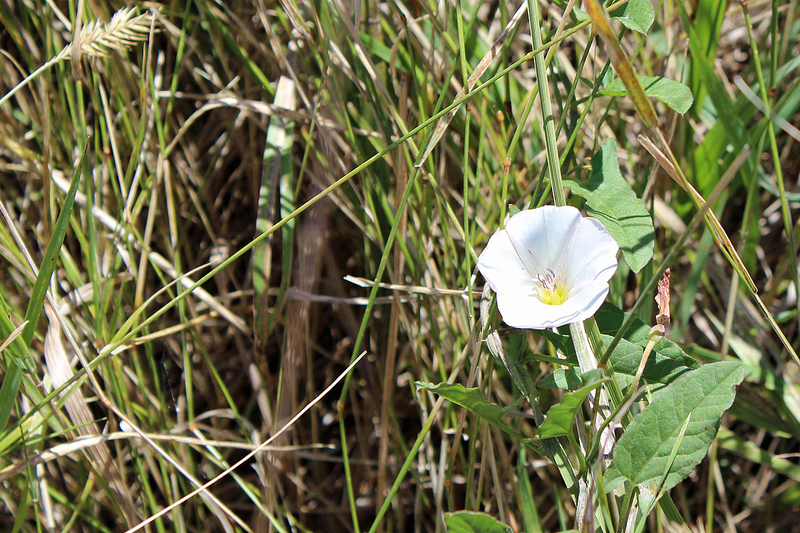 Then I turned around and snapped prairie wildflowers. 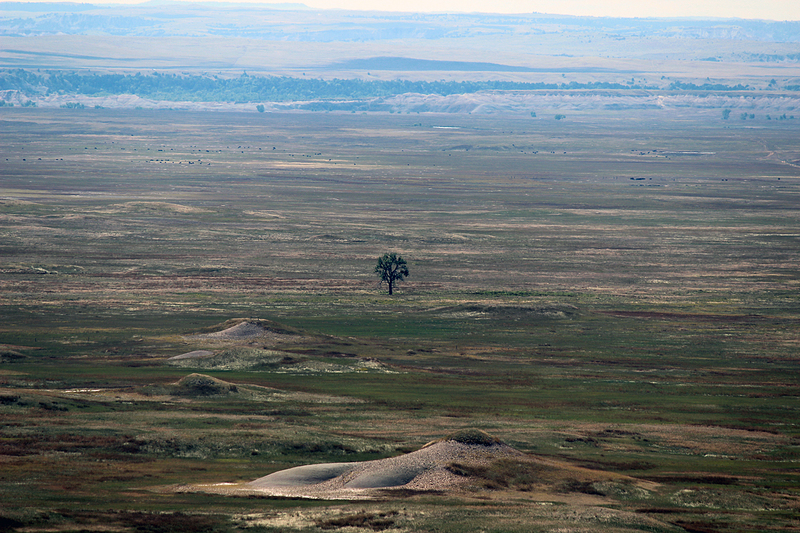 Pockets of woodland grew in canyons wherever it was cool and moist enough to support them, including (in the image below) along the north face of Hay Butte in the distance opposite the overlook. 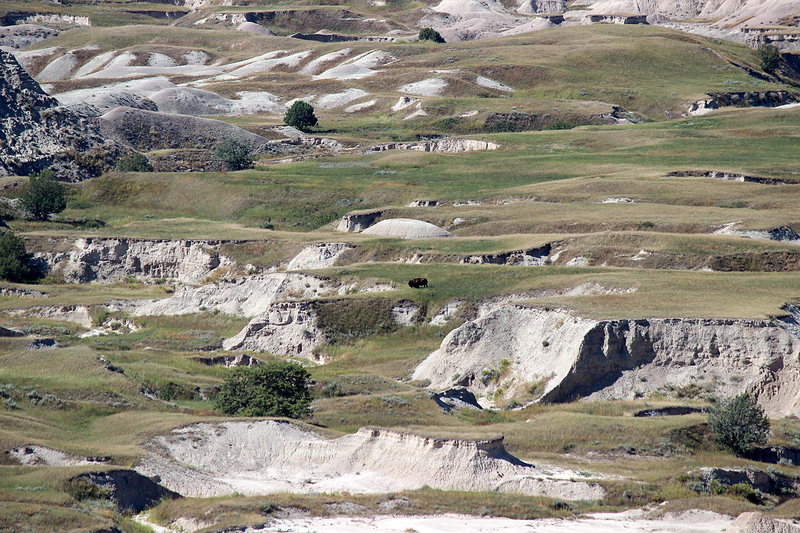 In the basin, a lone bison grazed. 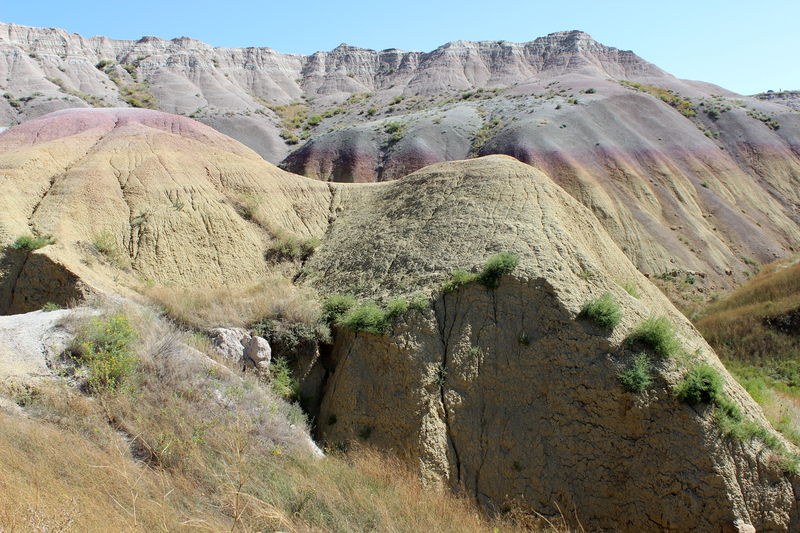 Seventy-five million years ago, during the late Cretaceous, western South Dakota was at the bottom of a shallow sea that divided North America from the Gulf of Mexico to Canada. 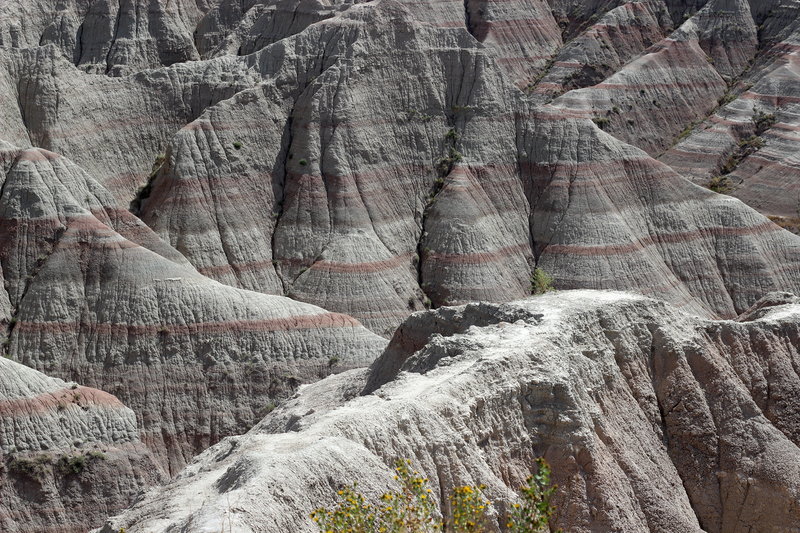 One of the lowest level of exposed rock in the park, rich with fossils, is the shale layer that comprised the seafloor. Roughly sixty-five million years ago, nearly coinciding with the mass extinction at the end of the Cretaceous, the North American plate began to rise and buckle, forming the Rocky Mountains. Volcanic ash spewed from the Rockies and drifted westward, settling over the Dakotas and creating layers of gray, porous sedimentary rock. 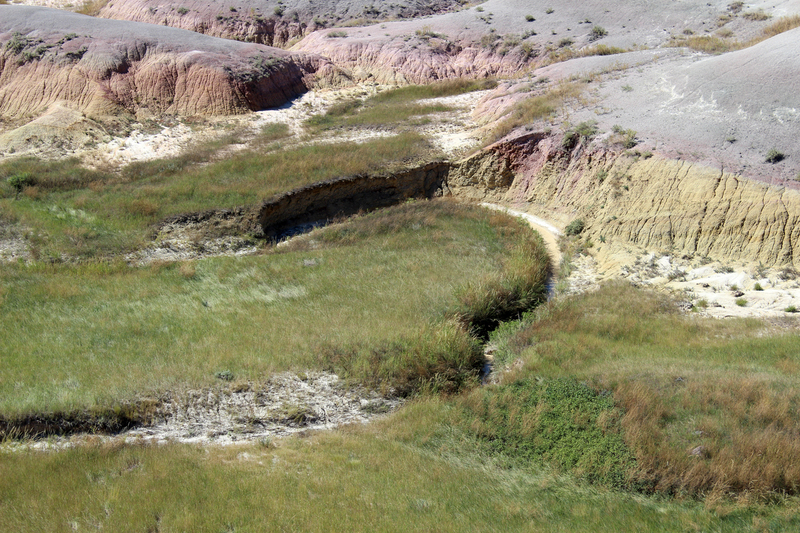 Throughout the age of mammals, more layers (rich with fossils) were deposited beneath what would become the western plains. 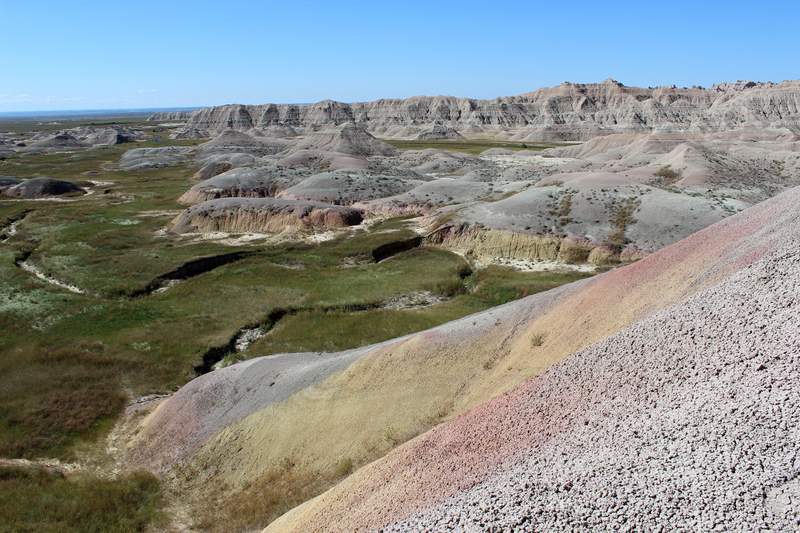 Twenty-four million years ago, the region was more arid than it is now and rivers and streams from the Rockies (draining either to the Gulf of Mexico or Hudson Bay) began to carve deeply and dramatically through the Dakota plains. 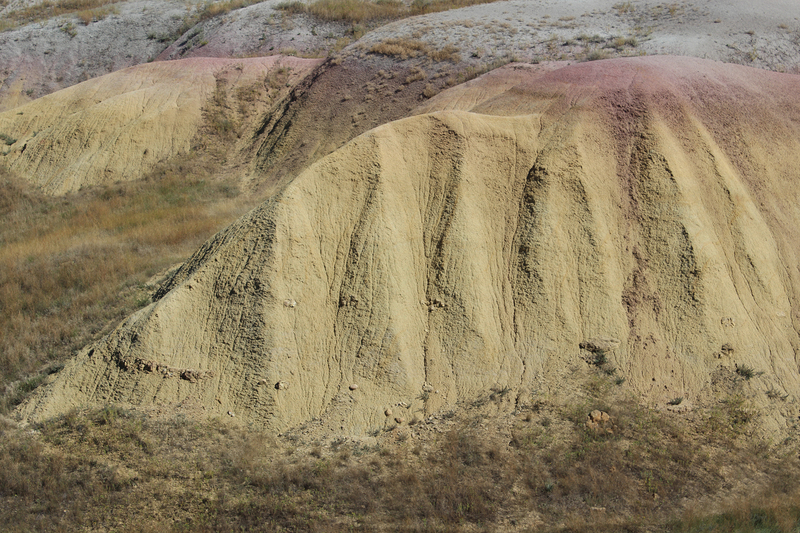 This was the start of the erosion that continues today in the Badlands. 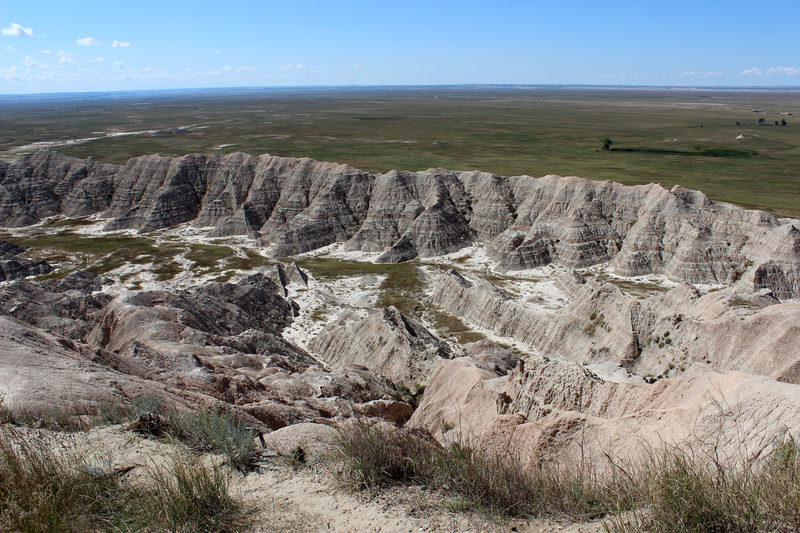 During the last ice age, the glaciers never reached the Badlands, so their immense scouring force did not interfere with the creation of the buttes, gullies, and formations in the park and its surrounding areas. 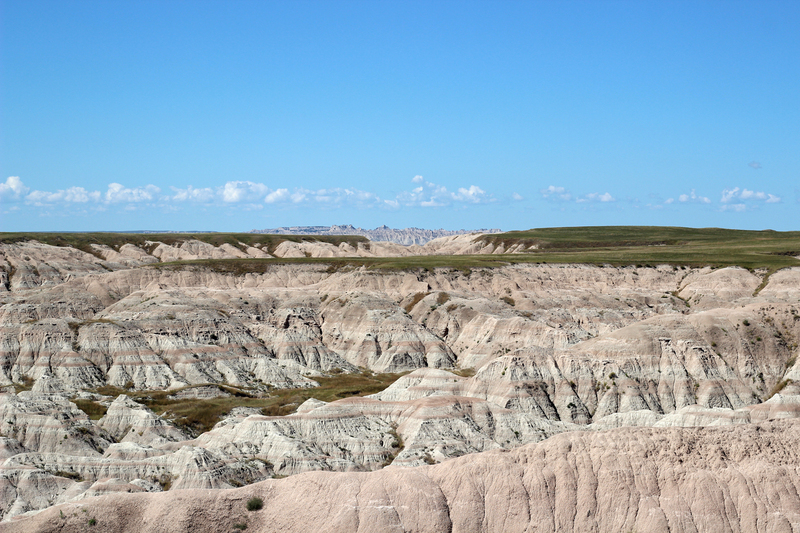 Lakota Sioux called the area “mako sika,” which translates as “land bad.” French fur traders, the first Euro-Americans in the region, referred to it as “les mauvaises terres à traverser,” “bad lands to travel across.” Although there are now regions on several continents referred to as badlands, the original coinage of the term comes from the areas of the western Dakotas. 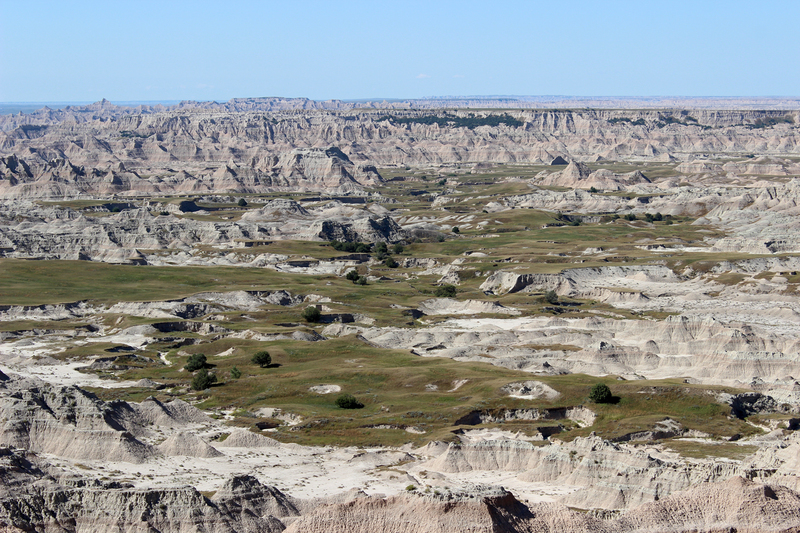 These are the badlands that gave rise to the concept. 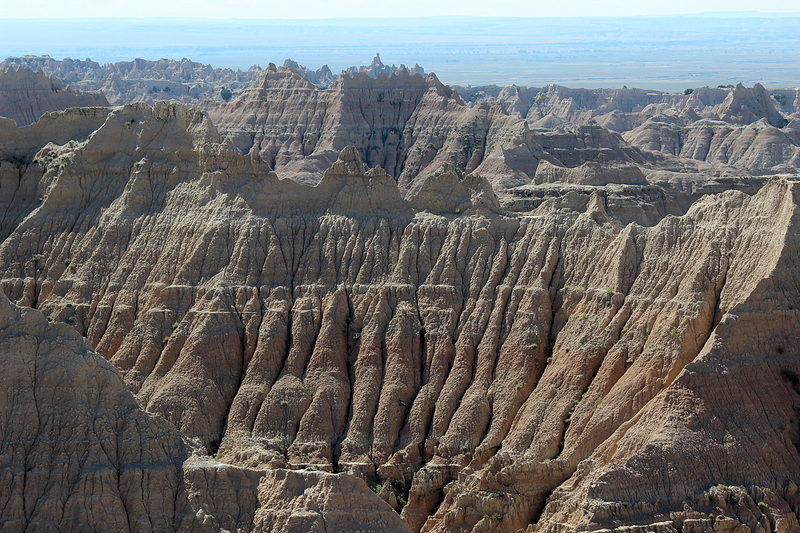 In 1909, South Dakota asked Congress to create a National Park in the South Dakota Badlands. 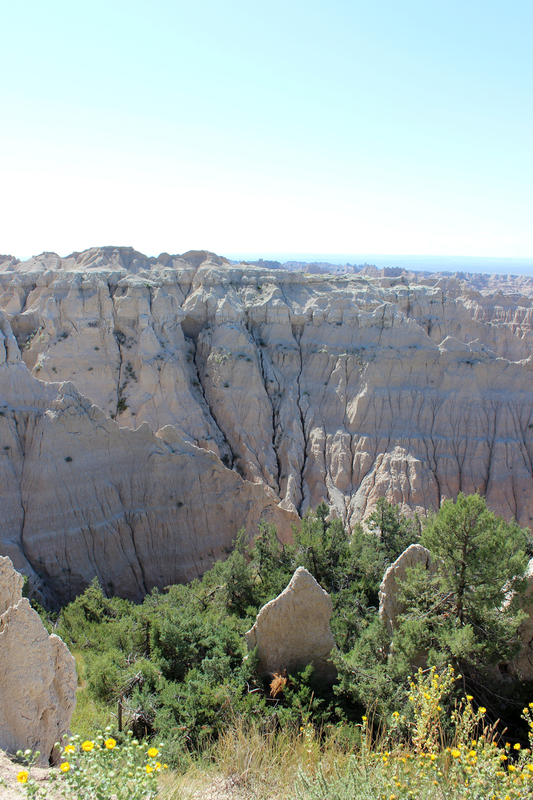 Congress failed to act, and in 1921 Senator Peter Norbeck, Progressive Republican of South Dakota who was instrumental in creating Custer State Park adjacent to Wind Cave National Park in the Black Hills, took up the cause to get the Badlands protected. In 1916, Congress had passed the Organic Act establishing the National Park Service. 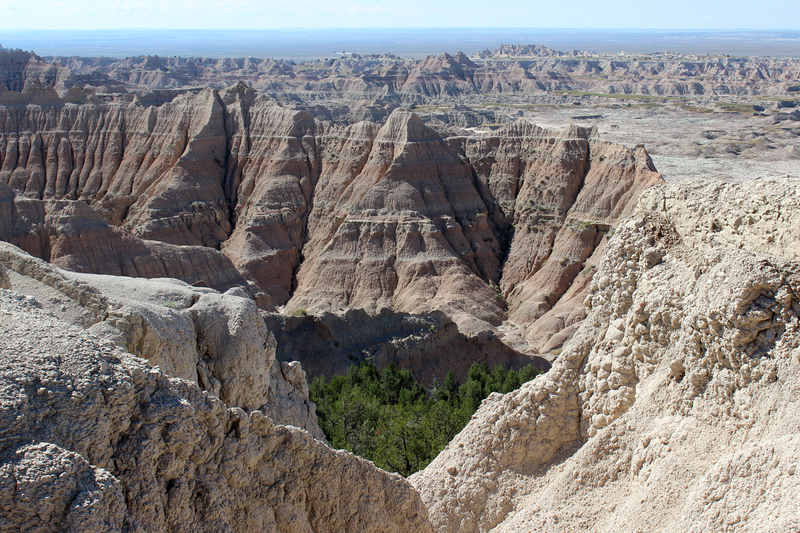 When Norbeck tried to persuade Congress to establish Badlands National Park in the early 1920s, the young Park Service balked, insisting that any of the new parks pending before Congress needed to undergo studies to gauge feasibility and appropriateness. 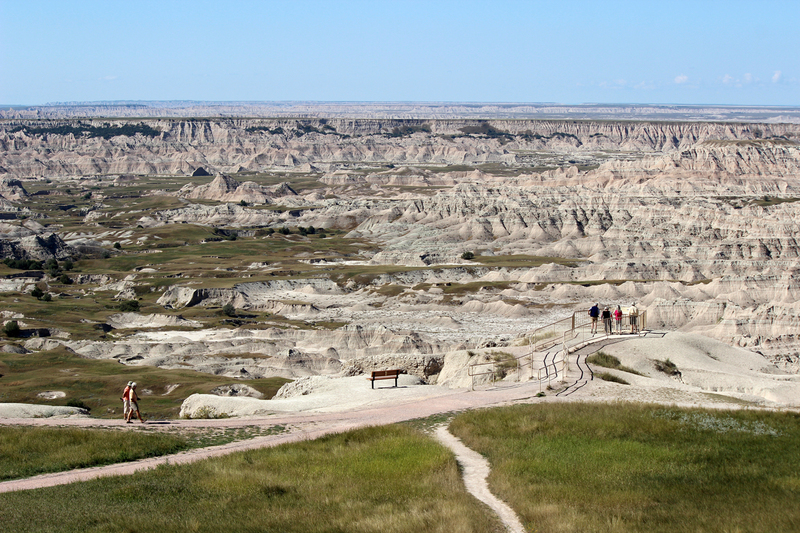 The low point for the proposed park would come in 1928 when Robert Sterling Yard, then head of what would become the National Parks Conservation Association, echoed the as-yet unreleased study by Roger Toll of the Park Service in an editorial that the scenery of the Badlands was not up to National Park standards. This was a period when the Park Service focused on protecting only what was perceived as the most impressive example of a landscape in the system. 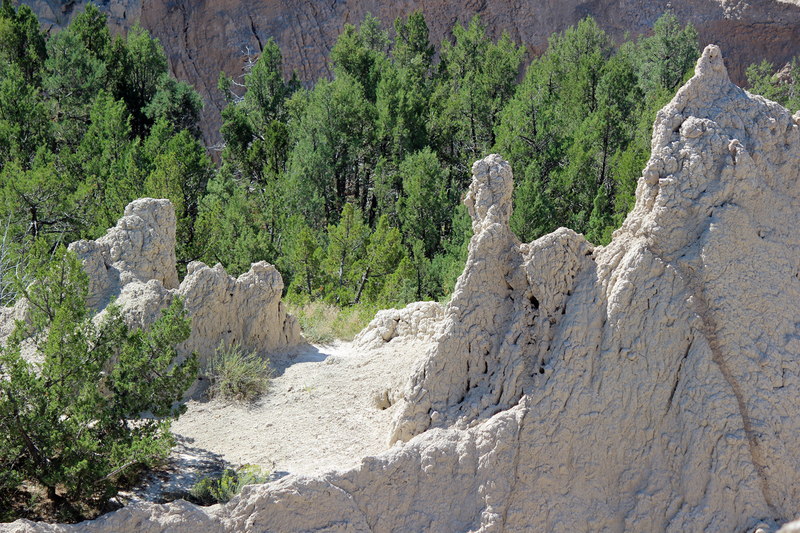 They argued that there were better examples of erosion at both Grand Canyon and Bryce Canyon. 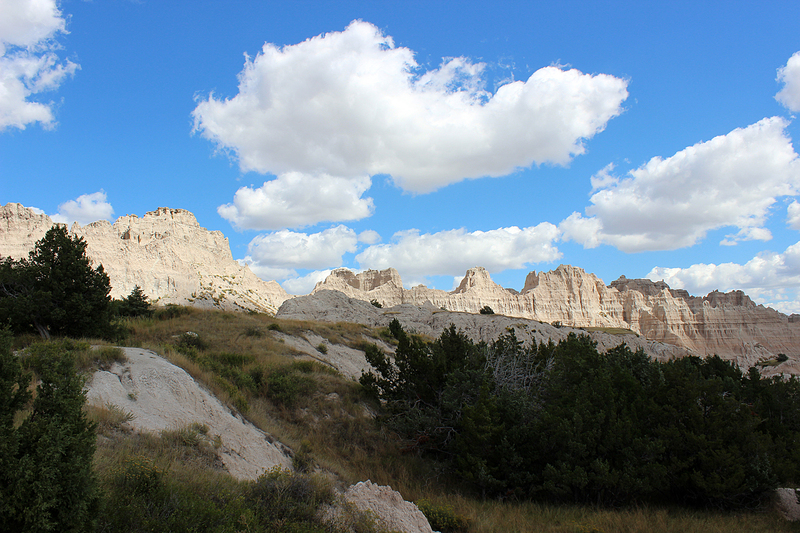 The scenic loop road was instrumental in Badlands National Park’s history. 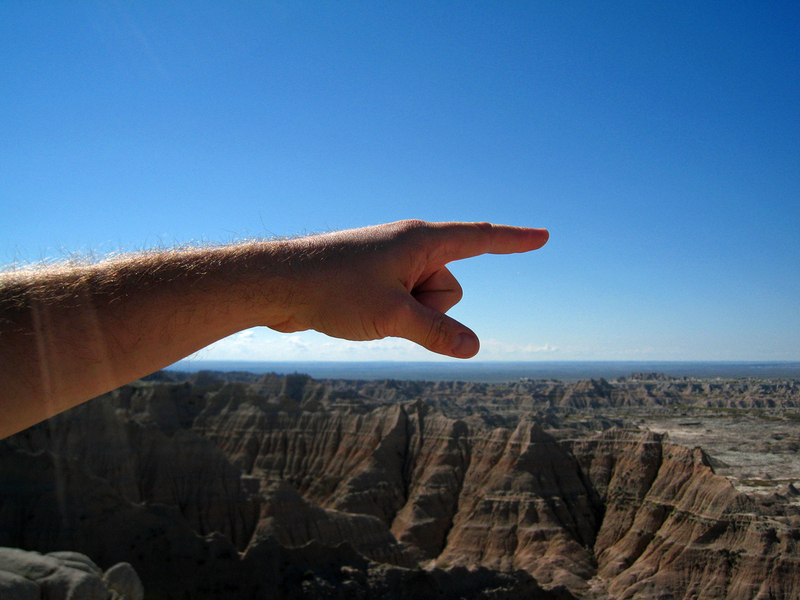 Angered but undeterred by the Park Service’s assessment of the Badlands, Senator Norbeck managed to push through legislation to have the Badlands declared a National Monument on the provision that South Dakota purchase the private land within the proposed monument boundaries and also fund the building of a scenic road. 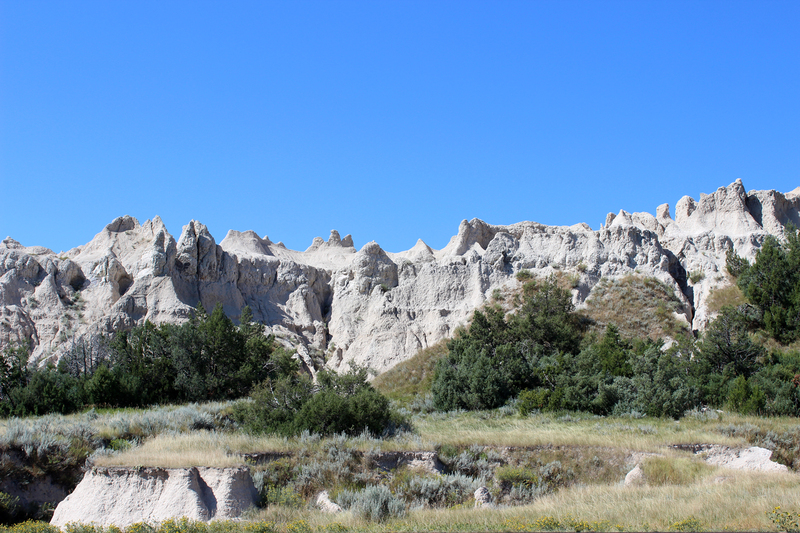 Another eleven years of land acquisition and road construction would pass before, in 1939, President Franklin Delano Roosevelt would create Badlands National Monument. 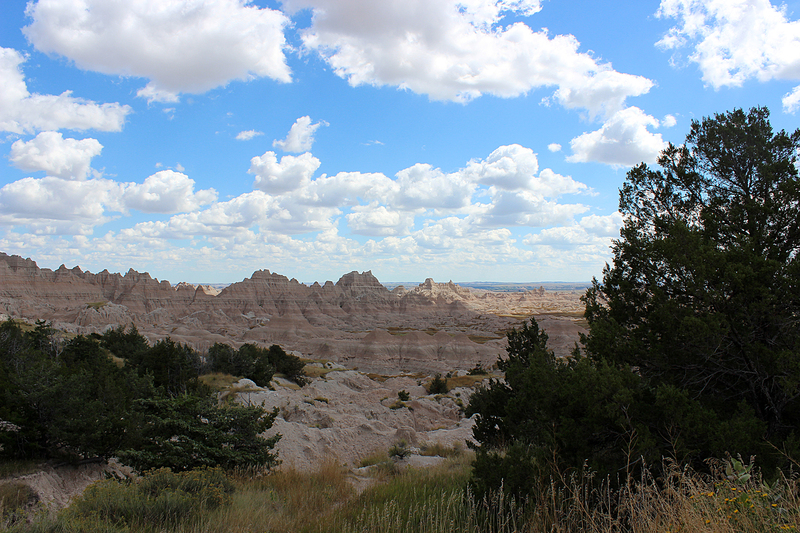 (2014 is the 75th anniversary of the Badlands entering National Park Service holdings.) Senator Norbeck died of cancer in 1936. 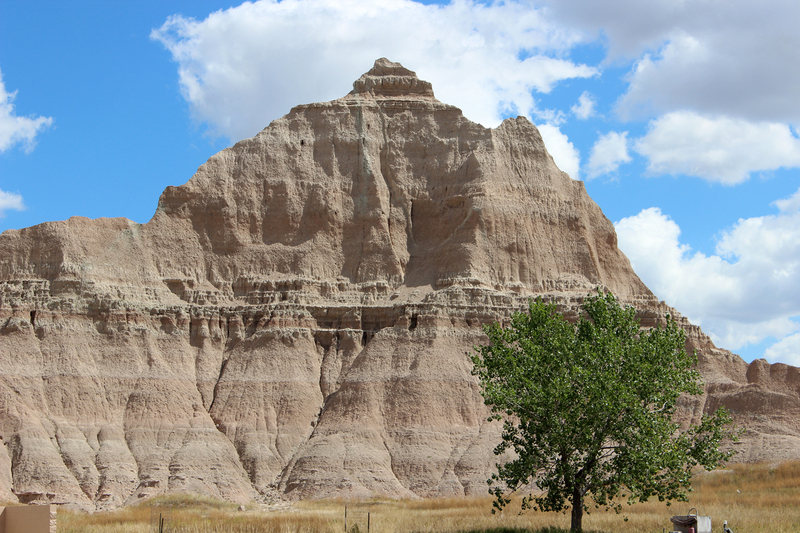 Although he didn’t live to see the monument established, he knew it was only a matter of time before the Badlands would be protected. The brilliant yellow-green staining of some of the rock layers resulted from organic materials from millions of years when the region was covered by a stagnant swamp. 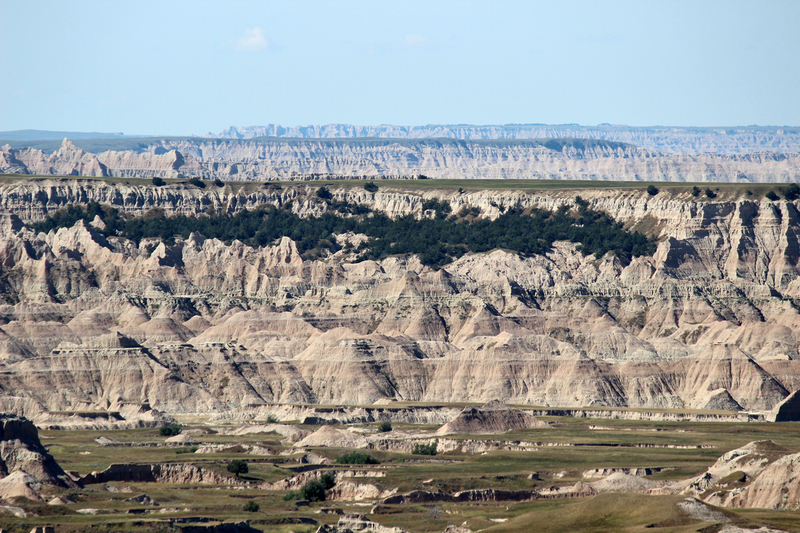 Some of the overlooks commanded views that stretched for miles across the Buffalo Gap National Grassland and into Pine Ridge Reservation. 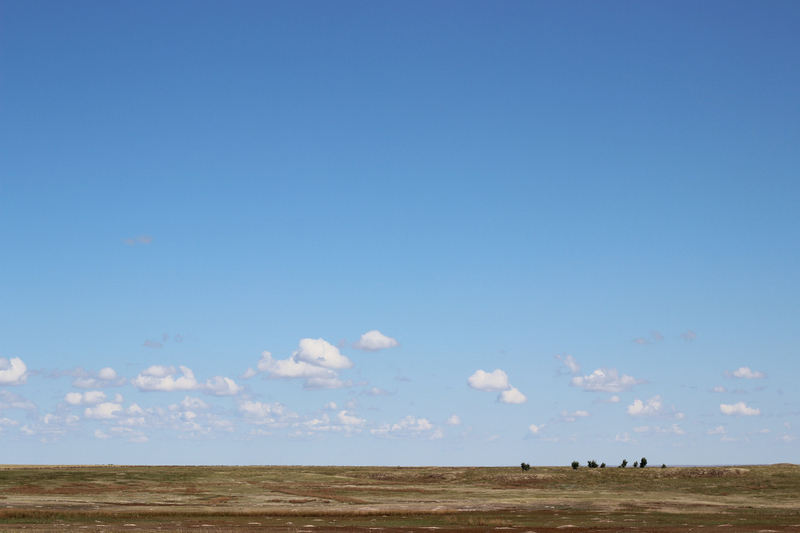 Sean was taken by the lone tree out in the midst of the prairie. The riparian corridor in the far distance is the White River. 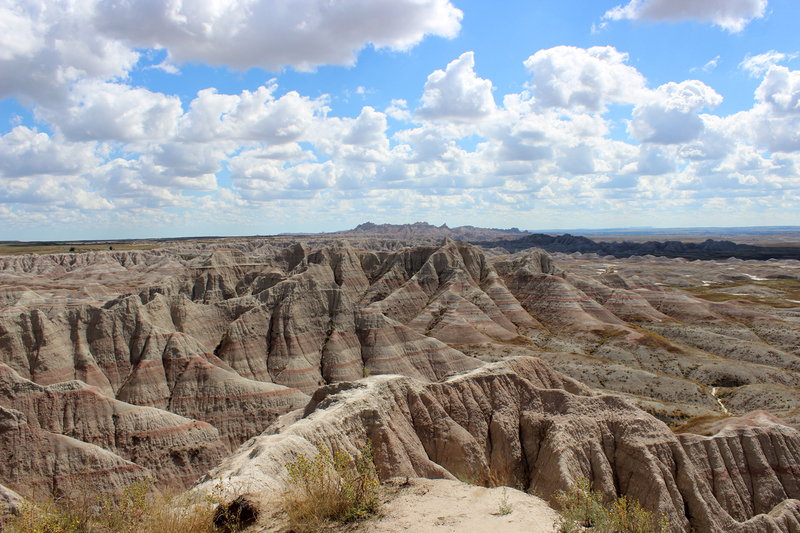 On November 10, 1978 (two days before I was born), after the addition of thousands of acres within Pine Ridge, Congress finally established Badlands National Park. 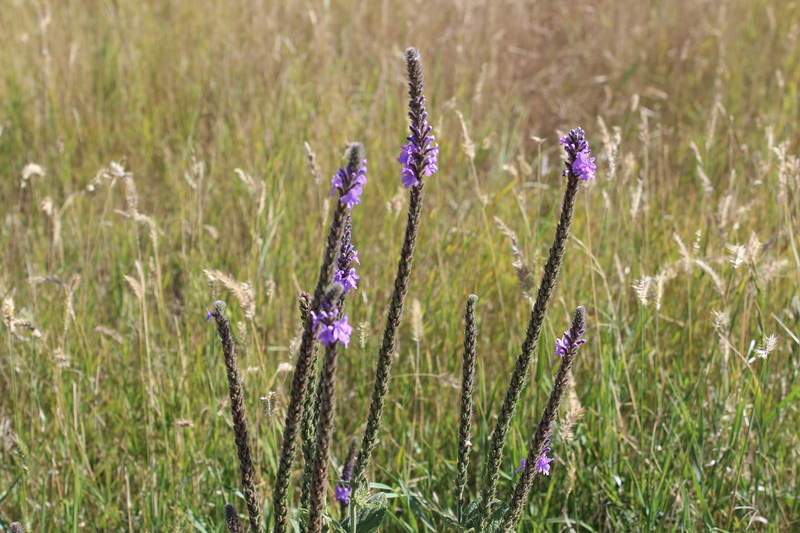 And always behind us was the vastness of the prairie. The road descended through Norbeck Pass and into the lodge, campground, and visitor center area. We stopped at the visitor center to get our National Park passports stamped, browse the interpretive exhibits, and buy books and souvenirs. After the visitor center, we headed partway up Cedar Pass to an overlook, where we stopped and lunched on peanut butter and potato chip sandwiches while gazing out at Millard Ridge. 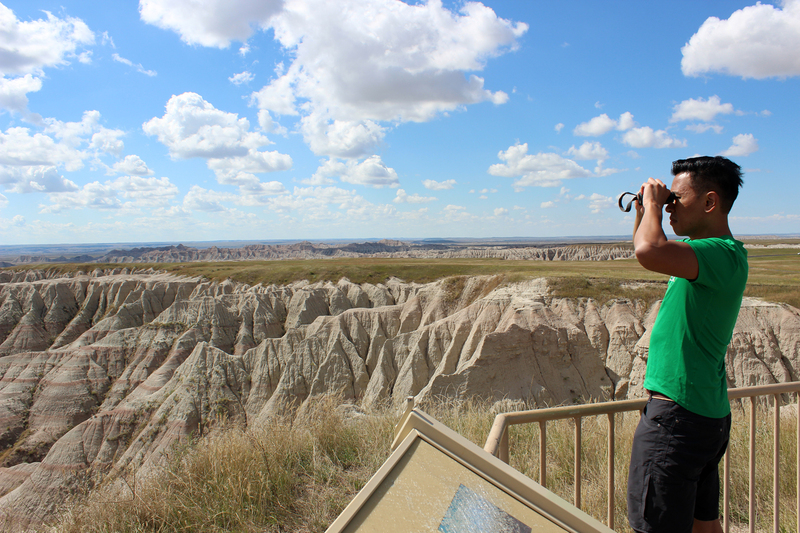 This entry was posted in Journey and tagged Badlands, Dakotas, National Park Service, South Dakota on September 22, 2014 by Brandon Hayes.